Bianca can’t walk away from her family—she’ll have to run. Following the death of her mother, Bianca and her dad are on their own. But when a redheaded stranger at the funeral claims to be her biological father, Bianca’s reality crumbles. She soon finds herself trapped between the alcoholism of one father, and the wicked schemes of another—with no way to escape. Ms. Kittrell delivers another well written and emotionally charged young adult novel centered on trust and deception. We revisit Redbank, Oklahoma during summer vacation. The plot unfolds at Bianca’s mother’s funeral. Her mother has been in a rest home for years after an attempted suicide and Bianca and her dad, Seth, have dealt with her condition each in their own way. Neither of them expected Bianca’s biological father, Chase, to show up at the funeral. His appearance and unknown existence to Bianca drive a wedge between her and the only father she’s ever known. Chase spends lavishly on Bianca taking her to plays and events in the city leaving his daughter and Bianca’s half-sister, Isabelle, out of the picture. Jealously builds between the girls but it’s all part of Chase’s plan. He wants Bianca to file a suit against the rest home for the wrongful death of her mother and profit from it. Well planned timing by Chase keeps Bianca from her youth group at Cornerstone Church, but Isabelle joins in changing her attitude. After moving into Chase’s home, Bianca discovers the real danger both girls are in. I’m very impressed with Ms. Kittrell’s ability to take a dangerous situation, one which many teens may be facing, and deliver such an impressive story. This Amazon Customer says it all: Kittrell knows how to write y.a., and kept this adult flipping page after page. About the author: Anna has written stories for as long as she can remember. She still has most of her tattered creations, leftovers she was unable to sell on the playground for a dime, written in childish handwriting on notebook paper, bound with too many staples. Her love of storytelling has grown throughout the years. She is thrilled to learn some people now believe her tales to be worth more than ten cents. Anna resides in small town Oklahoma with her high school sweetheart-turned-husband Tim, and their teenaged daughter Brandilyn. Anna works as secretary of her hometown middle school—the greatest place on earth this side of Disney World. 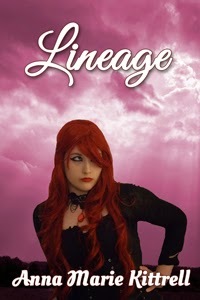 Purchase Lineage and Anna's other great novels on Amazon. Labels: Anna Marie Kittrell, Lineage, Prism Book Group. I so admire Anna Marie Kittrell's mission to write clean fiction for young people. Thank you, Carlene :) I love to read and to write YA--I'm still a kid at heart. Anna, how awesome to have a teenage daughter to bounce around ideas. Anna does an awesome job. I really liked the ending on this one. I thought Bianca was a goner! So looking forward to reading this, now more than ever! Nice summary and review, Victoria. And Anna, I think your book will be my Thanksgiving treat this year!